This morning I was blessed to be able to speak on the 97.3FM Breakfast Show with Robin, Terry & Bob. Some of you know that I’m the resident psychic reader on this top radio program (see interviews). The station’s name even adds to my lucky numbers (and lifepath) 29/11, which stand for spiritual healing. Perhaps it’s fate that we’re so connected. Robin, Terry & Bob: Hey Sarah! Terry: Now we’ve declared that you’ve seen our palms before Sarah. The most amazing day on the job for you. Was that as a palmist or with your work at the UN, or when was it? Robin: (laughter) And you’re with him now? Terry: So you actually said to him I see a tall, attractive Chinese woman in your future? Sarah: I said the best year of your life’s about to begin and it’s actually all come true. (Find your forecast, it’s free). Since then I’ve seen the number 11 all the time, which shows that you’ve just met a soulmate. 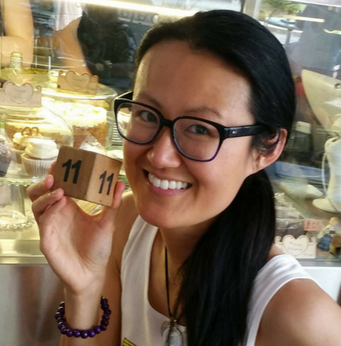 (11:11 suggests that you have met your twin flame, or soul family and that you have master numerology. See my facebook pages The Numbers Queen and Lifepath 11 for more numerology fun. ). Robin: Wow, I want to know more. Good luck…This Friday we’ll announce the winner…The Project News, delivered differently, 6.30 weeknights on TEN. Phew! It sure was a heart-stopping start to the day. What I didn’t mention on air was that Ellen DeGeneres (the TV host) ALSO sees 11:11 on clocks. It seems to have increased once she met Portia de Rossi, which suggests they are made for each other. Ellen even called her record company Eleveneleven (see this video). Her birthday is 26 January and mine is the day after. So we are number buddies in many ways. I recently wrote a list of VIPS I wanted to read for. A few days later I discovered an opportunity to read for Ellen, so manifestation really does work! In fact, I’ve just sent Ellen a full life purpose reading for Christmas, courtesy of Hollywood Swag Bags. It took Kris and I a month and hundreds of hours to prepare, so fingers crossed she loves it.Watch this space. Hello, my name is Sarah Yip and you should choose me for The Project because I’m your long-lost Asian Australian co-host. Like Carrie (Bickmore), I’ve had some serious illnesses including cancer go through my family. I’ve helped to raise millions of dollars for charities like the Cancer Council, so I’m a massive social activist and fan of causes. (As an aside, Carrie is in a personal success year, so I was super happy to hear that she is pregnant! She is a lifepath 6 and they make the best parents…the number 6 actually looks like a baby belly. Find your lifepath). Like Rove (McManus) and Peter (Helliar), I got my start in community TV (31 Digital) and I love sketch comedy, so you can count on me to support everything that you do. I’ve had a very unusual life, I’ve survived tsunamis, my grandparents had to swim away to escape war. I basically left a very successful career at the United Nations and in science to pursue my dream of being a palmreader. So I know what it’s like to rise from the ashes. I’m extremely original, hopefully a bit funny and I’ve got a very unique perspective because I’m almost six foot tall, Asian and I don’t play basketball. I feel so privileged to have made a career from my calling. I had to temporarily sacrifice my health, sanity, the approval of friends, family, a partner, home and a secure career to get here, but gee whiz it’s been worth it. What’s life if you don’t live it, right? So please, wish me luck with The Project and getting a call from Ellen Degeneres. I’m not attached to either outcome, but I would love the chance to show the world that miracles do come true.